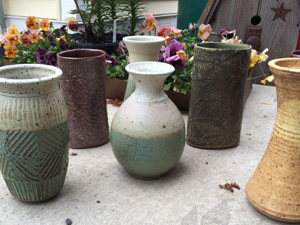 Levandowski Pottery was established in April 2003, when Jena bought Aron a set of pottery tools and a membership to a community studio in Minneapolis. Having little experience with clay, Jena needed a bit of encouragement, but it wasn’t long before she was a member as well. They each began with two shelves of space in this studio, which they quickly outgrew, so they decided to expand and share a full rack of shelves. The couple married in 2005, and found a great old home with plenty of space for their own studio in Dassel, Minnesota. Over the course of the first year, they began purchasing equipment while continuing to fire their pots back in Minneapolis, over an hour away. In the fall of 2006, they hired Donovan Palmquist to build a large, gas kiln which would allow them the freedom to fire all of their work at home. They now form 4-5 tons of clay per year into the pots they share during their open houses, traveling shows and in galleries across Minnesota. A day to support our local small businesses and thank you to those that support us.